Cocktail Impresario Mick Jeffries did not disappoint with his elegant summer drinks that matched Sonic's blueberry-sized ice globes with the last local blueberries we could find. Mick poured up small tastes for many of the adults at the largest ever (so far) Cornbread Supper: more than 60 people, counting all ages. 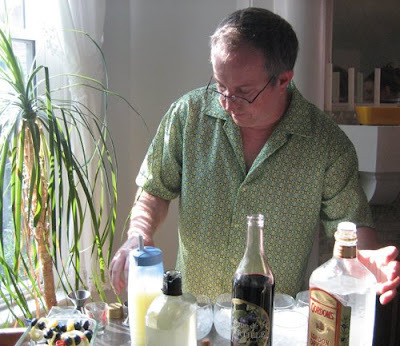 Mick's "Blueberry Bramble" had many talking about the mysterious combination of fresh flavors that included Creme de Myrtille (blueberry) liqueur and Koch Family Pineapple Sage-infused simple syrup. 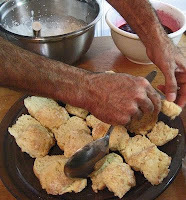 Another quintessential Kentucky berry -- handpicked wild in Anderson County earlier in the day -- also showed up and showed off in a Blackberry Shortcake set inside Cornmeal Biscuit Shortcakes. See the assembly and the finished beauties, two platters of which lived precariously short lives among the Supperians. I tasted a bite of berries with a bit of the hand-whipped cream, and said, "Mmmmm. Cloves!" Nope. "Allspice!" Nope. 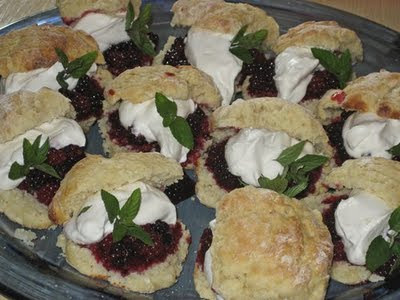 That's just Kentucky's wild blackberry flavor, part of our resplendent food heritage. I had forgotten just how much spice a wild blackberry packs into a stacked tower of flavors, from sweet to bitter, fruity to dark, tangy to deep. That complexity, I feel sure, helped thousands of Kentucky families from the late 1800s through the middle of the 1900s enjoy eating hundreds of gallons of canned blackberries -- precious, free foraged food -- each winter without tiring of the flavor. The tables at Campsie filled with wonderful food for this final Supper before a short break. Truth is - the house filled and the energy and activity levels built so quickly that I did not get many pictures. Not only that - I seem to have lost the thick stack of little slips of paper describing the dishes people brought. 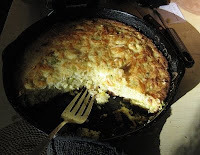 I know there was a picture-perfect Squash Soufflé, a Baconator Cornbread and three skillets of Blue Moon and Meadowbloom Farm Leek-Bleugrass Chevre feta vegetarian style cornbread - and I know it disappeared. August 10 Bleugrass Chevre and Slow Food Bluegrass host a special Country Cornbread Supper, with visits to the goats encouraged. 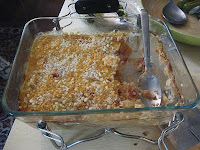 August 31 Cornbread Suppers at Campsie resume, 6:00 PM.